But I've heard mention for the below - which I was not aware of back then. From what I understand these were in a separate insert/centre section ('Freeplay'?) section. If there are scans of both of these floating about? The dates/issues of C+VG in which both of the above appeared? 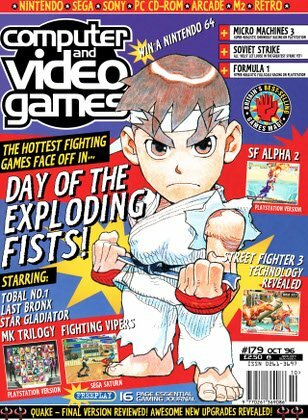 Your best bet for scans is probably Archive.org - IIRC they have most if not all issues of C&VG available as PDFs. Freeplay was a 16-bit monochrome pullout printed on yellow paper. It featured sales charts, unsubstantiated rumours, reader's drawings and ideas for games, tips and cheats and of course, the retro sections. These only ran to one page and mostly focused on the 8-bit micros and early arcade titles. Apologies, it's been a while since I checked. I was sure they had some later ones at one point. I would suggest Out Of Print Archive but it seems they've only got a few from '95/'96. You could always contact Keith Ainsworth direct. I think I still have his email address if you would like it, as I used to do lots of trades and buying off him. The Retro Cabin was only one page the rest of Freeplay fan was mostly very indepth combo's for Capcom 2d fighters, 2 pages of "drawings wot you done" with somebody called hunter taking the censored out off all the kids drawings. 2 pages of Fanboys arguing that they'd console was the best all rival consoles where garbage etc.. High scores and a few other things. Thanks for your info - I'm not much of a Forum regular, so missed replies until now. * However, it seems Issues 25 & 26 are missing from RetroCDN - Will have to see if avaiable via the other sources mentioned. # Also, was Issue 28 the final? As mentioned above Keith A's Original 'Retro Gamer' fanzine would be fascinating. I don't suppose they're available as PDFs anywhere? I contacted him after reading your post. Hoping that I'd be able to purchase issues that I don't have. He isn't actively involved in the gaming scene nowadays. Well possibly, but they won't come from him as all his Retro Gamer issues are "long gone"! I'll have to look mine out but I think I might only have 6 issues. Any idea, what issues of CVG these came in? I have every CVG issues from 1 to its end, so could try and see where it actually ended.